So this column is called "Get Out," but the weekend after the election, I decide to stay in and turn one small corner of my apartment into an art studio. For the last month or so, I've become engrossed in a new hobby: learning to paint. As a kid, I spent a lot of time doodling and drawing, even taking some art class electives in high school. Through all that time, though, I never really took the plunge and put down my pencils and ink-pens for a brush and canvas. FREE FORM Learning and practicing traditional painting techniques is fun, but sometimes you just have to let lose and paint whatever weird thing comes into your head ... like this weird green sailor dude. In the ensuing years, I put art aside and took up writing, a creative passion that I was fortunate enough to turn into a career. This year, I found myself looking for something creative to do as a hobby outside of writing. Artistic stagnation, if left unchecked, curdles into boredom, lethargy, or worse. And so, with some encouragement from my fiancée, I went wild at an art store and nabbed some paints, brushes, and canvases, and made a promise to myself that I would churn out a couple of paintings each weekend for the sheer enjoyment of it. After generously covering one corner of the living room with a plastic drop cloth, thus preserving the carpet and security deposit on the apartment, I set up the easel and acrylic paints. I open a cold beer, put on some music, and I am ready to tackle my first painting of the day. A few weeks ago I'd purchased a copy of Learn to Paint in Acrylics with 50 Small Paintings by Mark Daniel Nelson. The book is supposed to teach you the basics by having you copy 50 very small paintings on little 5-by-5 inch canvases. I'd committed myself to painting all 50 tiny pieces over the next few months. Today I'm on No. 2: a simple abstracted landscape. The challenge of this painting, so the book says, is to mix the limited palette of paints to varying hues. As usual, my results are far from perfect. Some colors are off, and lines and brush strokes could be cleaner. Still, I'm happy with the overall result. CLOSE ENOUGH My attempt to paint an abstracted landscape yielded mixed results, but practice makes perfect. With my more serious attempt finished, I decide to reward myself with painting something out of my own head for fun. 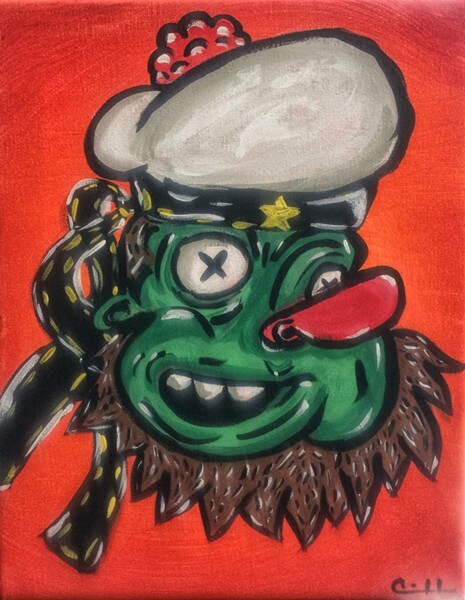 On a larger canvas, I spend a little more than an hour painting a cartoonish looking sailor. He is a sort of grizzled Popeye character with green skin, because why not? Once again, the results aren't exactly what I'd imagined. I could agonize over the millions of flaws in it, but I remind myself for about the zillionth time that the enjoyment comes from learning and the process itself. And that is really one of the most interesting things about painting. What I am learning in my early attempts is that the result you see in your head is rarely what ends up on canvas. The joy of painting is trying to use the skill set you are patiently building to see just how close you can get to the idealized image in your mind. It's hard to let go and accept that you won't and can't be perfect at something immediately. In The Artist's Way, author Julia Cameron writes "perfectionism is not a quest for the best. It is a pursuit for the worst in ourselves," and I tend to agree with her. Too often, we are pressured to assign a utilitarian purpose to our creative passions. But in reality, creativity for creativity's sake is just as valuable. Painting, with its emphasis on practice, patience, and learning from your mistakes, reminds me of the importance of creating something for the sheer joy of creating it. I'm hooked. 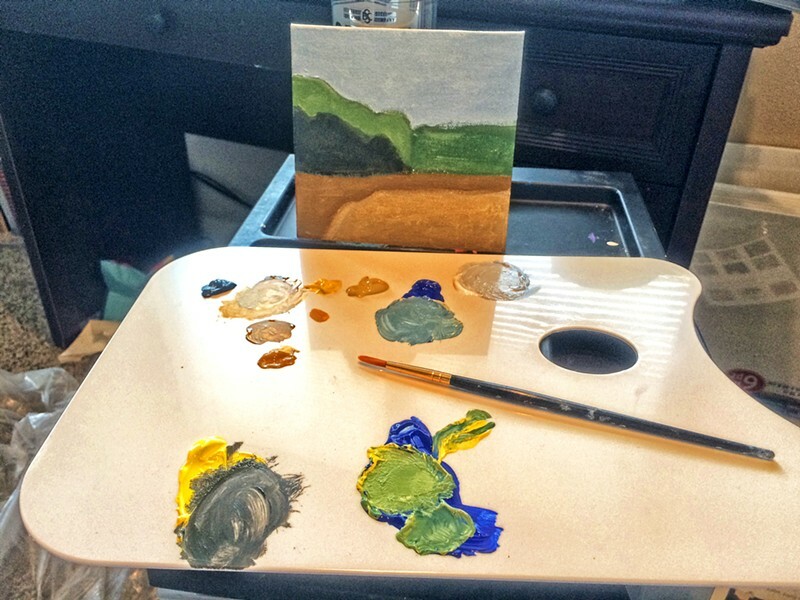 Staff Writer Chris McGuinness has decided that Bob Ross is his spirit animal. He can be reached at cmcguinness@newtimesslo.com.